is this years decorations on my tree. and I blended white with snow critters for my take on a white woodland theme. glass, white, silver and gold ornaments with angel keepsakes and pops of red. hang beside crocheted snowflakes and clear lights. This daytime shot shows the ornaments a little better. I placed the tree beside the piano this year and enjoying it here. a vintage John W. Schaum Christmas Album piano book. with glowing lights that come on each evening. with evergreen and pine cones. Trees in white, gold and silver on each end of the mantel. with pops of red berries and clustered red ornaments. tucked in the evergreens and pine cones. To the hearth I added a wire basket filled with glittery antlers and old wood spindles. in white, green and again that pop of red. and candles on timers that come on the same time each evening for 6 hours. The rest of the pics are from around the room in little spots here an there. I love this white and mercury glass Santa, a gift from a dear friend several years ago. Gold snowflake pillow with a red throw just waiting to curl up with on a cold evening. surrounded by a ring of evergreen, pine cones and berries. More vintage ornaments with a tree topper and bells still filled with their original angel hair. The hearts in sliver and gold I created with pipe cleaners along with the silver sugar spoon ornament. White pitchers filled with greens. several years ago, hang on the piano back. My inspirational painting topped with magnolia leaves. All is calm, window sill display. Spreading the JOY of the season! Thank you for stopping by my sitting room tour. Wishing you a wonderful December Day! Celeste, I love your sitting room! The Woodland/Snow theme is so pretty and sparkling like a new-fallen snow. Your home is simply gorgeous. I really love your mercury glass Santa - just precious. Good Morning, Celeste. What a festive sitting room. I love the pops of red. Those vintage ornaments under the cloche are gorgeous. Hope you enjoy the weekend. love the little critters for the tree! So very cute but the decorations I like the best are the ones made by you! Oh so wonderful - I love your festively decked living room - fantastic and cozy! Your wintery woodland theme is so pretty. I think your little critters are precious. It all looks so pretty Celeste and I love your beautiful windows!! Love the woodland theme! My theme is the same every year! LOL! Colored lights on the tree, and the same ornaments! However, when it is my turn to host Christmas Eve dinner, my table is always different. I admire your individuality and creative spirit. Everything Always looks amazing! Hi Celeste! Oh, my goodness! How more beautiful can your home get? What a lovely place and your window is gorgeous. I love the arches. Now your decorating is so beautiful! Love the arrangement on you piano and your mantel is so pretty. I need some little reindeer! That little 'Merry Christmas' pillow is just darling! Oh, if I could only come for a visit - it would be enchanting. All beautiful, Celeste. So much love in every detail. I especially love your gorgeous windows, so dramatic. The piano reminds me of mine of over 40 years, which I left behind when we moved. I used to decorate it just like a mantel for the holidays. This magic season is flying by so quickly, but I'm very intentionally savoring every delicious morsel. Every single day is a joyous occasion. I'd sit in your gorgeous room and dream away for hours. Enjoy it all, my friend, and thank you for having us. So very pretty, love the pops of red on the tree. Absolutely stunning...all of it. You have been blessed with how to put things together to turn a house into a home...things that bring comfort to the soul. Oh Celeste, everything is magical and so beautiful. Your sitting room is breath taking. I love it all. You never cease to amaze me with all your wonderful talents. Have a warm cozy weekend. Your sitting room is just beautiful!! Love your windows!! I love all your woodland creatures...I have the same white deer that you have. Mine are in a vignette with a vintage snowman and a Mercury glass tree. I've fallen in love with all your cute woodland creatures, my imagination is working overtime with the beauty you have filled your home with this holiday season. Such a pretty room, Celeste! I love your tree. 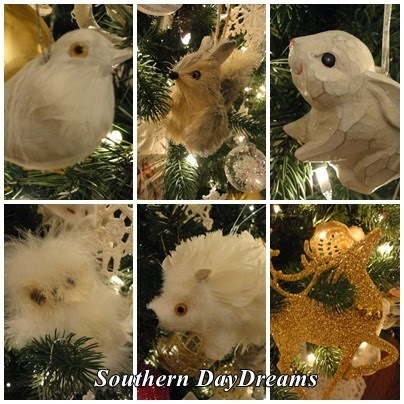 I definitely want to get some owls for my tree for next year. I'm going to be on the look out for them at the after Christmas sales. (A new tree is also on my list!). So beautiful Celestina! I love the woodland theme, so warm and inviting! Enjoy!! Everything is so beautiful and perfect, sweet Celeste. The woodland creatures are deightful with the white and pops of red. And may I just say those glittery antlers are fabulous! Are they real antlers that you glittered up? It all looks so cozy Celeste!! I Love unpacking all the Treasures each year. I think my Favorite has to be the Painting, did you do that? Have a Wonderful Day!! Celeste, you have chosen one of my favorite themes! I adore the Woodland items you have throughout your decor! Your home is magical! You have been a busy girl! Oh my so pretty. Love this room and how gorgeous warm and cozy it is. What a very beautiful post dear Celestina Marie. I so love your sitting room with all the lovely white furnichures and piesec. The little critters on your tree are wonderful, and so are the white snowman, the deers and all the greenery in those great pitchers, too. Thank you for showing, and a happy sunday to you. Your room is lovely, Celeste. Thank you for the tour. Everything is gorgeous!! You must love to sit in there in the evenings, all snuggled up, and cozy with the candles, and lights all aglow. What a beautiful Christmas wonderland! Oh Celestina... Everything is absolutely, positively gorgeous! Your home is filled with the love of your heart, that is very evident. Again, you have inspired me to use my decorations in different ways and get out of the box. :-) I am blessed with many beautiful Christmas items, some from my precious mother who LOVED to decorate, and I tend to do the same thing every year with just a little twist. Its time to expand again! It is always a joy to visit you. Wow, you really outdid yourself yet again, Celestina! I see so many things I love, I don't know where to begin:) Love the stockings you created with your grandmas lace. And your woodland critters are just too cute! I also love your painted and stenciled box near the tree, it's gorgeous! Did you paint the French sign that is near one of your "up high" displays? Also really love your pretty tree and deer collection! Oh, and the cloche with vintage ornaments is perfect!! your tree and mantle look magical, celeste! the hand made stocking are darling, too! everywhere i look it's full of festive christmas vignettes! Your home is sparkling, Celestina! Your decorations are beautiful! Your decor is so pretty! I'm a big fan of the woodland look for the holidays. Dear Celeste, your decors are absolutely fairy and gorgeous. I love everything...the woodland ornaments, the Christmas tree, the white glass Santa Claus...wow, wow, wow!!! This was like looking through the pages of a magazine Celesina! All so beautiful. You really paid attention to details! I love it all! Everything is so beautiful Celeste! I really love the woodland theme, and all the cute little creatures on your tree, including that adorable little hedgehog. The mercury glass Santa is also very special, and those vintage ornaments under the cloche. I noticed greenery, too, hanging from a light fixture/chandy?, so pretty! I love how you took that picture of Santa in the woods and used it as your inspiration piece. So loving all of the beautiful white!...Your room is so wonderfully decorated...such a pleasure to view every detail!.. Oh My! Everything just gets more and more beautiful. Another gorgeous room full of décor. Did you make that darling Christmas pillow with the houses on it, and that beautiful little snowman? Your mantel looks beautiful, and only you would have glittered antlers. How pretty. Gorgeous home and decor! Your home looks so beautiful! Dear Celeste, I have enjoyed looking through your blog posts this morning as I drank my morning coffee! Your studio space is so inspiring. Years ago I was an art teacher and I think the creative bug will always be with me. I look forward to visiting here again...I need some inspiration! Merry Christmas to you! Love your cozy sitting room with all the beautiful white and red touches and your lovely tree. The woodland creatures and the snowy bird houses are sweet too.